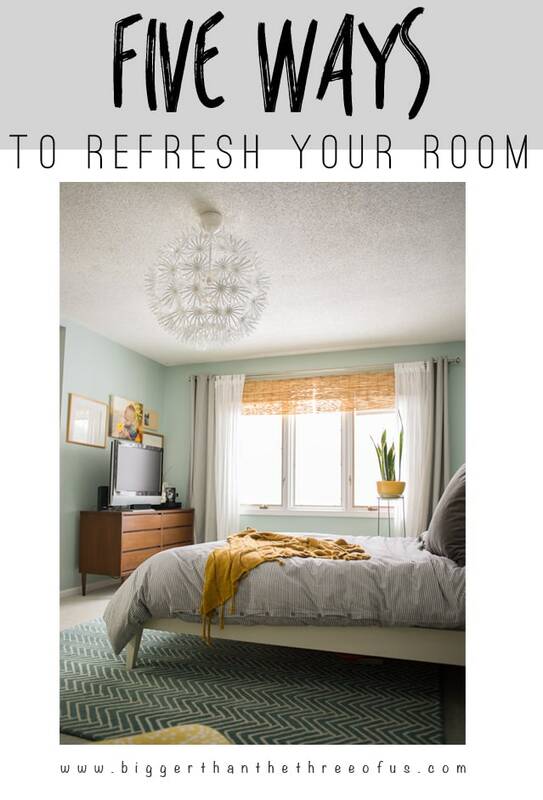 I was writing this post as an update to our master bedroom. We did a small switcheraoo and I thought I would share. As I was comparing the before and after picture, I realized that we had a few small changes that happened over time that I didn’t even realize. Then, I was thinking about those small changes and realized that I was able to change the decor without spending money. I think everyone is on board with that, right? So, today I’m sharing ways that YOU can change your decor without spending money… and I’m sharing them along with the small changes in our master. When we revealed our Master Bedroom last year, I knew there were a few things that I wanted to tweak. One of those things being this dresser. We bought it in a set six years ago for the little man’s nursery. We bought it at a baby boutique store and the selling point was that all the pieces could function in an adult room. We thought Greyson could grow with the set. The crib converts to a toddler and then to a full size bed. We would have kept it all (even though it’s not my style now), but the way that bed converts it’s like 4 1/2 ft off the ground to get on it. I’m not sure what the manufacturers were thinking with this one. I have the longest legs ever and I have to kinda hop on it. It’s super weird. Right now we have the other pieces of the set in the guest bedroom but I’m going to Craigslist them soon. So, back to this dresser. It’s GREAT storage just not my style. I’ve debated selling it with the set, but seriously the storage in it is so great that I hate to part with it. A long time back, I posted this thrifting purchase on IG. I believe the dresser was $35. Sold. I wasn’t sure exactly where I was going to put it, but since our house is still lacking furniture I knew I could find a spot. It’s played musical rooms for a bit, but finally I knew where it needed to go. It needed to replace the dresser in our bedroom. So, I unloaded all of the drawers in both dressers and did a switch. Seriously, I’m so happy with the switch and it’s got me itching to do other switches in the house. Do you have any pieces of furniture that you could repurpose in a different room? How about chairs that you could recover easily? Move a throw blanket from one room to another. Decorating doesn’t have to be expensive if you think outside the box a bit. Like I said earlier, I didn’t realize the changes that had happened in our room until I saw it by comparing the pictures. I did these five things and it gave me room some new life. Everyone has extra throw blankets. Change them up. Move them from one room to another. Layer two of them on your bed for a different look. I don’t have tons of extra pillows in a linen closet or laundry room. I do have a few on each couch and on each bed. For a different look in the bedroom, I moved a lumbar pillow that I had on the couch to the bedroom. That one change felt different and allowed me to change things up without spending money. Do you have extra fabric sitting around or fabric napkins that you don’t use? You could easily make your own pillows to change up your decor. Or try this trick that I did with ill-fitting clothes. Do you have a console table that could be used as a media unit? How about a dresser that could be used as a buffet? Or a pair of sitting chairs that could flank your table instead? Think outside the box with some of your furniture pieces. Move them around and try them in different arrangements. This is FREE and sometimes you find something you LOVE more than what you originally had. Are you bored with your wall frames? If so, give them a new look with paint. Or, if you are just bored with your art or photographs, print some free art. I’ve rounded up some printables here if you are interested. I took off one of the frames on my gallery wall behind the tv and it just opened that wall up a bit. We all have extra pots and accessories. Move them around and change them up. It can be fun to do and give little spaces (especially nightstands, plant stands, and end tables) a totally new look. So, there are five new and EASY ways to change your space without breaking the bank!